I am working on some new pieces, with the hopes to get myself together to have a solo exhibition next year. I need to put the entry in by the end of this month. Nothing ever stays the same > Pondering the way that my visual voice shifts & morphs, but I think still similar. Do you think? Do you see ‘me’ in my weavings and my stitch work? I guess the only way is just to listen to my whisper, the quiet soulful voice of working with the muse and making my work. And if I make it with my own voice, then it must be my voice. These pieces look totem-ish to me. They feel like trees of memories. I know what the exhibition will be called (I’m going to keep that quiet to myself for a little while). But it’s about memories, motherhood, self, ideas, thoughts, the shifting shadows in our souls & minds ... and other stuff. Haha. Thought I should finally start using this blog to document my process as I happens. Small quick snippets of work. Would you be interested in seeing that? Its raining here today. Again. Yesterday was pure glorious sunshine and now we are back to the moody skies, those feelings of internalising a day. It’s been raining for weeks. But the grey clouds have a good way of talking to me. I saw the moon last night. A moment of wakefulness. 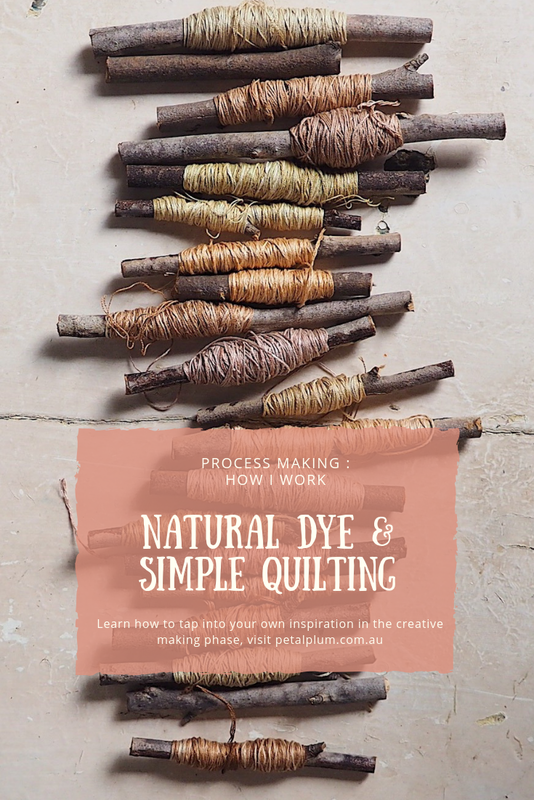 Heres the fabrics - naturally dyed with a combination of eucalyptus, iron-y water, seedpods & leaves gathered, bark (eucalyptus), silky oak leaves, rose leaves, onion skins. And the pinks are ranunculus & anemone flowers - the darkest purple ones. I can’t wait for more of them next Spring! I’m using a combination of vintage kimono silk, scraps of other fabrics from my collections and also a little bit of new silk or linen.